Please note: This vision was developed for Taos NM. It can easily be adapted for any city. As I now live in Santa Fe and have an ideal site for this project, I will adapt it for application in Santa Fe NM at a future date. This outline presents an integrated concept for a music plaza to serve the needs of Taos and Taos County residents and provide a new hub for activities all focussed on the central theme of music. Music is an integrative medium. It brings people together. It takes people into a landscape that is beyond words and difference. It binds and it enriches the heart. Taos is a unique artistic milieu consisting of at least three rich cultural environments. It is also one of the poorest economical regions of the USA, depending, to a large extent, on the tourist industry for its economic survival. The foundation of this concept of a music plaza is that it provides an integrated cultural and financial dynamic for the local population, not dependent on the tourist industry, while it serves the tourist population at the same time. It will even draw tourists to Taos. Taos is rich in musicians, composers, musical instrument makers, music festivals, musical heritages, and a diverse population of appreciators of these diverse musical expressions. We have the Native American heritage incorporating drum and flute, the Hispanic mariachi, canciones and Spanish guitar heritage, the Anglo Country and Western, Bluegrass, Folk, Jazz and Classical musical traditions. Taos is home to the Taos Jazz Festival, The Taos Community Chorus, The Taos Chamber Music Festival, The Bazouki Festival, to mention a few. Cafes and coffee shops abound that feature world-renowned singer-songwriters, poets and visiting musicians from diverse traditions from all over the world. 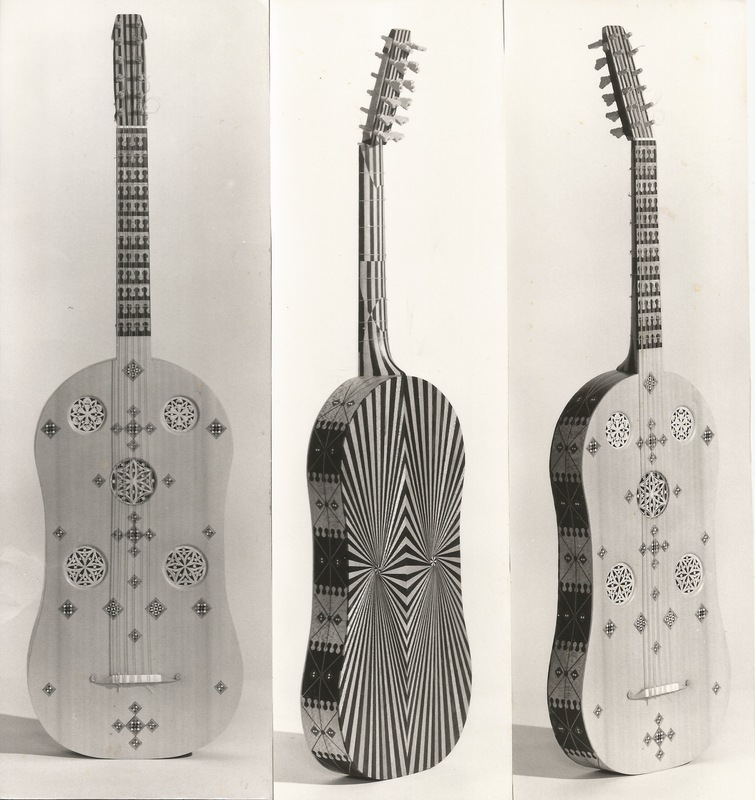 There are makers of quality harps, guitars, banjos, drums, Native American flutes, string instruments, dulcimers, etc. all living and working in Taos County. Taos has at least two major companies that sell and distribute Native American drums to all corners of the world. Performers like Robert Mirabal, Michael Martin Murphy, Tish Hinojosa, all living or having lived in Taos, are known far and wide. The Music Plaza is designed from the center in a horizontal concentric motion that incorporates and weaves together more and more elements of the whole as one moves towards the periphery. It is designed around the geometry of the circle, the sacred hoop, that encompasses and brings together all separate elements into an integrated whole. The design incorporates the four elements of Earth, Water, Fire and Air represented in different areas by sculptures, foliage, fountains and art, all revolving around the theme of music. The Music Gallery will be loosely divided to display the different instrument families around the theme of the four elements. 1) In the center of the complex is a circular performance stage large enough to accomodate a chamber orchestra, chorus or band. The stage and the auditorium space is below ground level. The stage can be level with the floor of the auditorium or raised. It is designed to slowly revolve, allowing everyone in the circular auditorium and upper levels to view the performers. In the event of a smaller audience, the stage can remain stationary and the audience will be seated in an arc that would allow everyone full view. 3) Surrounding the performance space, at ground level, and protected by a guardrail, is the main concourse of the complex. Tables are set around the periphery of the auditorium where diners and/or audience can sit and view the performance. If space allows, a second concentric circle of tables can also exist. Between some of the tables will be spaces where stairs and possibly a lift will allow access to the lower level. 4) Beyond the circle of tables will be circulation space for movement around the complex. This is a pedestrian-only area, similar to a shopping mall. Dotted around the “promenade” are islands with flower beds, benches and four statues that represent the four elements as related to music. Flower beds and occasional benches also adjoin the buildings. 5) The exterior of the physical complex is a circle of buildings housing the elements previously mentioned in the composition section. There are a few gaps between component buildings to allow for service and access with a wider main entryway. Stairs also allow access to the roofs of the buildings where a further circle of tables or benches constitutes a third audience terrace, protected by guard rails. Storage and operations compartments is also provided for at the periphery of this terrace, close to the sides of the domed roof. 6) The domed structure will be built on the exterior foundation walls of the buildings. It will be detailed in a separate section of this outline. 7) Surrounding the building is access space for pedestrians and service vehicles, lined by landscaped flower beds, shrubs and bushes, lilac being primary. Occasional benches will be placed for the convenience of the weary. A main, wide, footpath leads to the entrance. In the center of this footpath is a wider circle containing a fountain sculpture. 8) Radiating from the circle of walkways and paths in four directions will be landscaped parking areas. Between these parking areas will be sections of grass with 3 other sculptures. The parking areas radiate in a V shape with vehicle parking along the inside “walls” of the V. In the center of each V is a single line of parking spaces. The drawings illustrate this concept. At the opposite end of the complex, 180 degrees to the entrance pathway, is a service driveway allowing access for vehicles to make deliveries, etc and for emergency vehicle access. 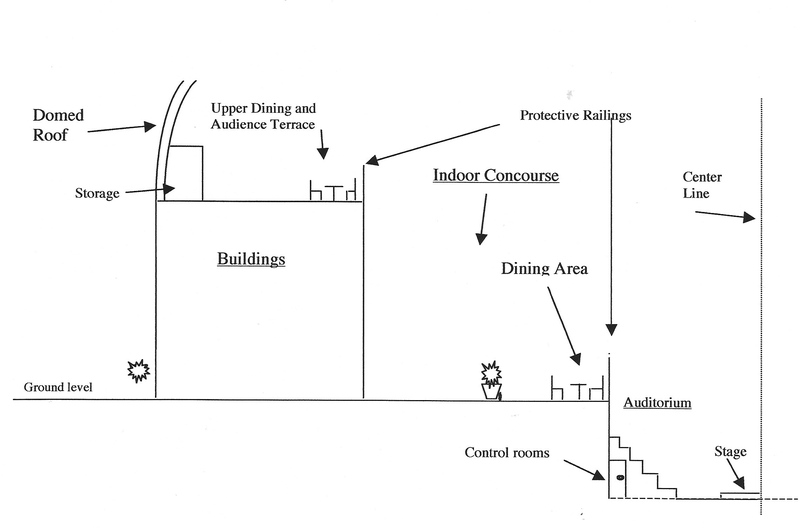 The size of the complex is determined by the size required for an adequate stage as the center of the complex. An estimated 24 foot diameter stage would allow a small chamber group, chorus, band, etc to perform. It is designed to slowly rotate at a variety of speeds or remain stationary. The size of the auditorium would then be determined by the requirement for enough tiered seating in a circle around the stage to allow up to two hundred viewers. The tentative estimate is a 20 foot extension from the stage would allow a circular auditorium of 5 tiers of seating, which allows for a 3 foot aisle around the stage. The circle of seats would be divided in two to four places by staircases allowing access to the 2nd through 4th rows of seats. This extends the diameter of the inner “kiva” auditorium and stage to approximately 64 feet. Radiating out from the auditorium at ground level is the main concourse of the plaza. Approximately 6 feet of space alongside the safety railings overlooking the auditorium would be allocated for tables and chairs for the restaurant clientele ( who can also be part of the second terrace of the audience. The concourse extends a further 20 feet beyond the circle of tables, totaling about 26 feet to the beginning of the buildings. The concourse is dotted with flower beds, shrubs, occasional benches and the sculptures previously mentioned. These would be concentrated alongside the buildings, in the center of the concourse and beside the railings between a few tables. The inner space of the plaza, therefore, extends in a radius of approximately 60 feet from the center of the stage, or constitutes a diameter of approximately 116 to 120 feet. The dome would be constructed of tubular metal sections like the lines of longitude lines on the globe of the Earth. Either the building’s outer walls and roof will be built strongly enough to support the weight and centrifugal pressure, or the tubular members will be embedded in, or attached to, the circular foundations of the buildings and be embedded in the walls. If the engineering parameters allow, the buildings should be made of reinforced adobe bricks. Concentric circles of tubular metal join the longitudinal members together like the latitude lines on the globe, so that in effect the domed structure looks like a globe of the earth in it’s gridwork structure. This is different in nature from a duodesic dome and for some reason unknown to me, is preferable. In view of the physical scope and expanse of this complex, it would be difficult to find an already existing site in the Taos area to accommodate the full vision of this outline. If the Taos Arts Association and the Taos Community Auditorium would be interested in a complete restructuring of the present complex, i.e. demolishing the existing building, converting the present parking facilities and expanding somewhat into the Kit Carson park, this complex could be scaled to fit the present site of the TCA. Undeveloped sites would therefore be the only alternative in the town of Taos itself. The location needs to be as central as possible. It would seem to me that to get a project such as this off the ground, a co-operative effort on the part of numerous agencies such as the developers of the project, the Town of Taos, Taos County, The Taos Pueblo, NM State Road Department, investors, Non-profit organizations, etc., would be required. It would make the most sense for this project to be a non-profit entity or corporation so that it would be eligible for funding from various sources, private, government and public. My vision is that the entire operation, from its inception all the way to its completion and day to day operation, be seen and structured as a co-operative venture, a co-operative business or agency, and that the entire project be undertaken entirely by residents, contractors, employees etc who live in the Taos county area. This would provide a tremendous boost to the local economy and provide an ongoing opportunity for locals to benefit from the entire project as well as contribute their talents and expertise to its manifestation. Outside investment can be incorporated into this concept.